Howard Phillips Lovecraft’s unique contribution to American literature was a melding of traditional supernaturalism (derived chiefly from Edgar Allan Poe) with the genre of science fiction that emerged in the early 1920s. The Thing on the Doorstep and Other Weird Stories brings together a dozen of the master’s tales—from his early short stories “Under the Pyramids” (originally ghostwritten for Harry Houdini) and “The Music of Erich Zann” (which Lovecraft ranked second among his own favorites) through his more fully developed works, “The Dunwich Horror,” “The Case of Charles Dexter Ward,” and “At the Mountains of Madness.” The book presents the definitive corrected texts of these works, along with Lovecraft critic and biographer S. T. Joshi’s illuminating introduction and notes to each story. The Thing on the Doorstep and Other Weird Stories. By H.P. 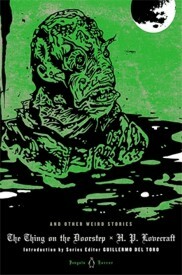 Lovecraft, edited with an Introduction and Notes by S.T. Joshi. New York, NY: Penguin USA; 2013; ISBN 978-0-14-312232-6; hardcover. This book may be purchased in hardcover from Amazon.com or Barnes & Noble or directly from the publisher, Penguin USA.